Whether or not you voted for President-elect Donald J. Trump, what is likely to matter most ultimately is how Trump Administration’s policies affect your wallet. Mr. Trump’s stunning upset already changed the arc of American history, but what happens next — policies, people, and politics — ultimately will determine whether history will treat him as kindly as his hero, Ronald Reagan. President Trump will have to work with Speaker Paul Ryan (R-Wisc.) or whoever is the next Speaker of the House of Representatives. Assuming Speaker Paul Ryan retains his post, his proposals and comments will be as important to watch in the months ahead as President Trump’s. Mr. Ryan holds the key to the purse strings. Remember, a simple constitutional matter: revenue bills start in the House of Representatives. Mr. Ryan is well-versed in tax policy and economics, perhaps more so than the President-elect. Perhaps the President-elect will defer some of this to the Speaker. No one knows exactly how that dynamic is going to play out. However, it’s certain they both want the same thing: a Federal tax law that’s easier and good for the economic growth. 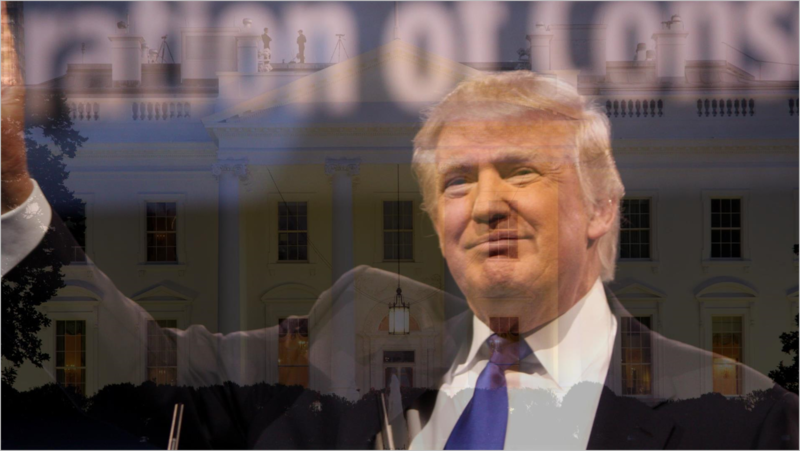 Mr. Trump’s victory is widely believed to reflect directly the sentiment that businesses and individuals are overwhelmed with the complexity of the U.S. tax code and regulations surrounding it. It’s wise to expect reform. 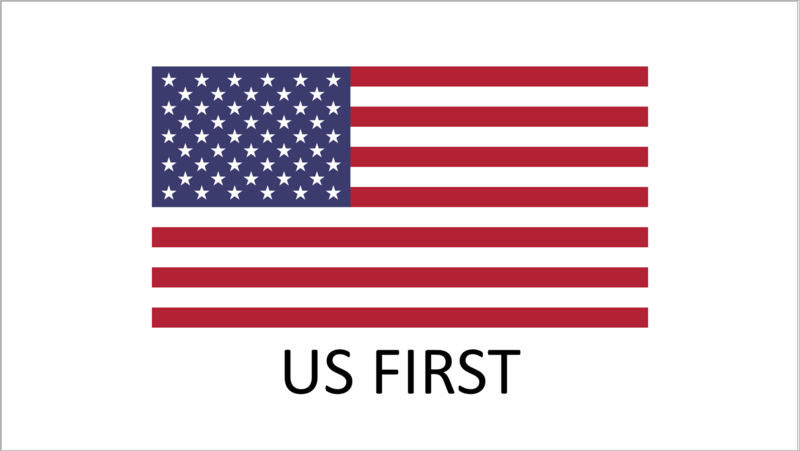 President–elect Trump’s "U.S. first" foreign policy is likely to take shape in a change to tax laws to encourage repatriating money from overseas, with the goal of bringing that money back home and putting it to work in America. That could bring billions back that companies will invest here. 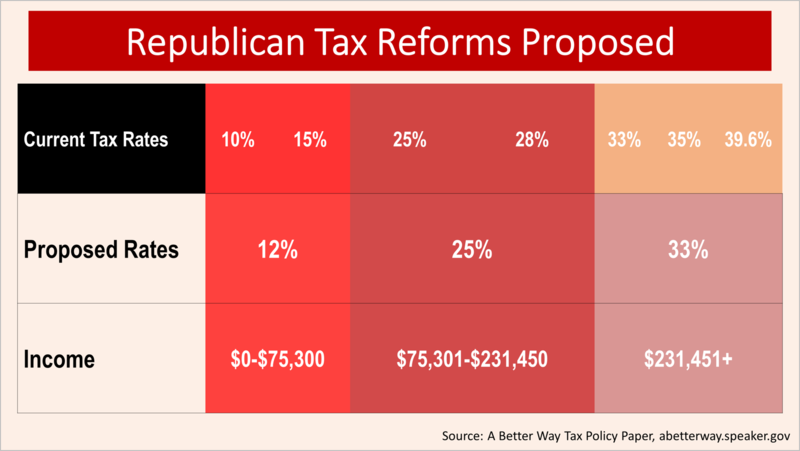 With House Republicans looking to build a consensus on the shape of the reform legislation, observers are drawing a parallel between today and the massive tax reform of 1986, enacted in Ronald Reagan’s second term. Ironically, it was a time when the nation was fascinated with Back To The Future. 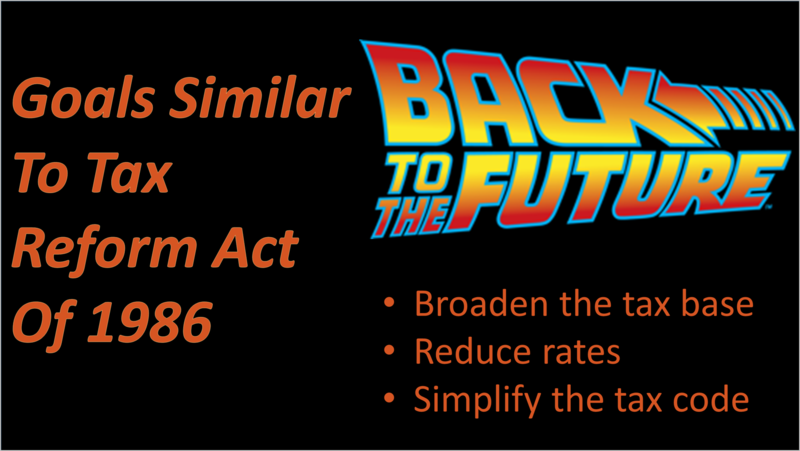 If they are right, the changes to tax laws that are ahead will have a similar goal to the tax reform of 1986, then expect a broadening of the tax-base, reduced rates, and simplification of the code. 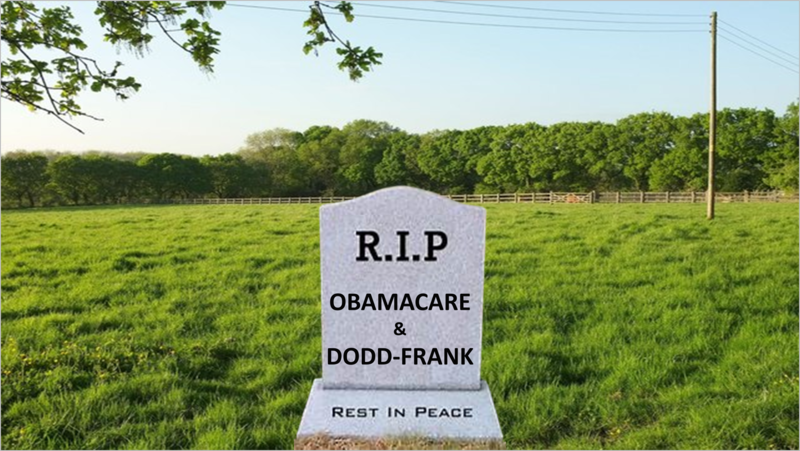 Obamacare is probably gone or drastically changed. In addition, Dodd-Frank legislation, a massive change in banking and financial regulation that followed the financial crisis and has been implemented slowly in the last few years, will almost certainly be amended. In a hint of how the changes are expected to impact broad sectors of the economy, bank stocks soared because of the potential for rising interest rates and the great likelihood of changes in the regulatory climate. Now, the political theme is tax relief for Middle-America, and simplifying the tax code. Expect lower tax rates and a broadening of the tax-base. What steps should you take now? Here are some thoughts. The marriage penalty will perhaps finally be eliminated, as well as complicated tax calculations like the Alternative Minimum Tax. Child care expenses are likely to be excluded from taxation, perhaps without limit. The estate tax will likely be eliminated, perhaps in favor of requiring heirs to recognize gains. A provision of the rules affecting Individual Retirement Accounts (IRAs) could be changed at any time, and it would curtail the benefits of so-called Stretch IRAs. Retirement income planning will change drastically and this issue will be followed closely by us in the days immediately ahead. 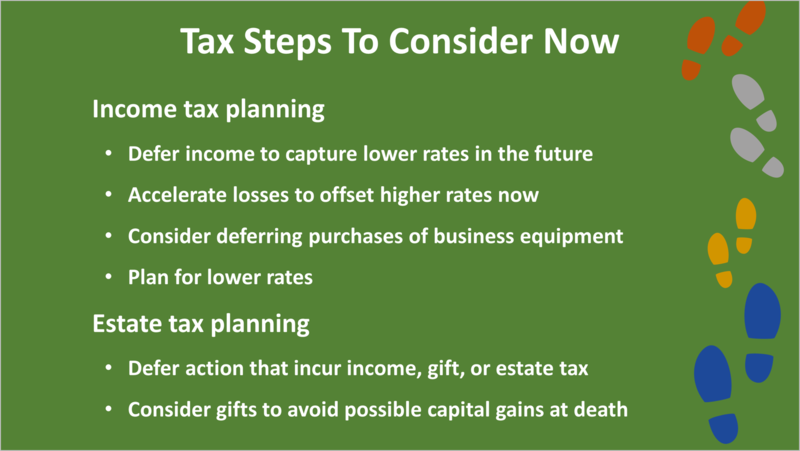 The estate tax may be repealed in favor of either taxing capital gains at death or eliminating the "step-up" in basis upon inheriting property. If we’re going to end up with no estate tax, but some type of carryover basis upon inheritance, the world will be upside down as far as your estate planning techniques. Although we don’t know exactly what the next Presidential Administration will do, the Trump Administration is expected to simplify the tax code by reducing the number of brackets from the current total of seven to three — a 12%, 25% and 33% bracket. This aligns with the House Republican plan. If rates are going down, we want to defer income this year and capture lower rates in the future. We want to accelerate the recognition of losses to offset higher rates now. Evaluate whether you should buy business equipment now or later. If you need a new copy machine that’s $25,000, maybe you buy it in December rather than January. If we’re going to have lower rates in the future, should you be doing Roth conversions? Probably not. That’s something we’re going to keep you updated on and requires personal counsel. 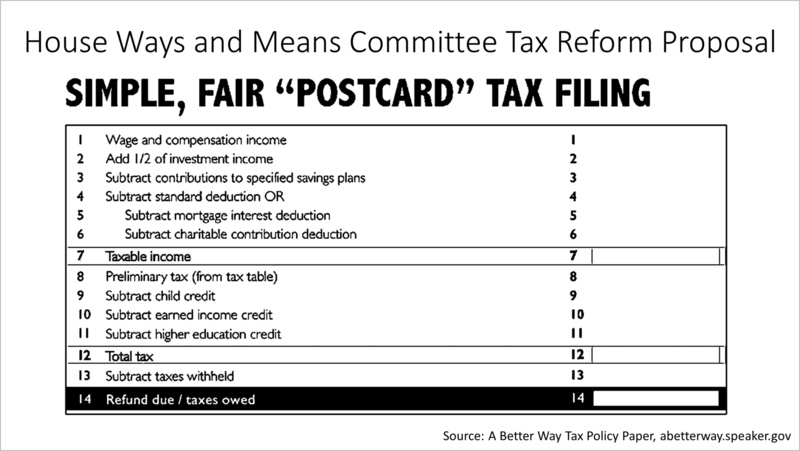 The Republican-controlled House Ways and Means Committee has proposed a postcard-size tax form for families. Filing a return would look something like this. Maybe this can happen for the lower 60% or 70% of tax-filers. National tax preparation firms targeting lower and middle income individuals will face challenges perhaps. However, the exemption parents receive for each child and many other deductions would be eliminated. Taking a step back to get the big-picture, tax simplification is hoped to redeploy brainpower now spent on designing tax schemes to more constructive endeavors. Channeling the great minds now spending all their effort on outsmarting tax rules into science, technology, engineering, and medicine could be good for society, civilization and Americans, and unleash new growth. President-elect Trump’s policies and proposals are encouraging to so many Americans. But how the tax cuts will be paid for remains a huge question mark. A massive interest bill will come due annually starting around 2023 without fixing the financial hole caused by Social Security, Medicare and other entitlement programs. 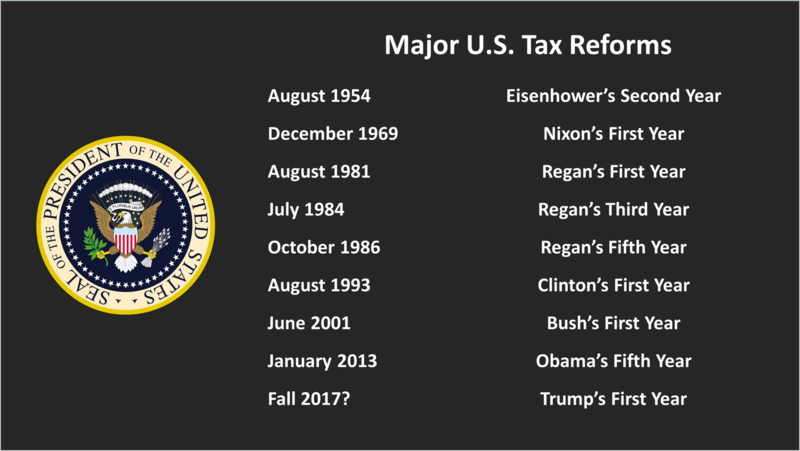 While the changes to come are likely to be massive, this is not the first time the federal tax laws have been reformed. We’ll help you keep focused on what’s important, as the financial planning and wealth management landscape change. This report is based on information gathered on November 9, 2016 by a financial journalist at Advisor Products Inc. based on research and analysis by Keebler Tax And Wealth Education, an educator of legal, accounting and financial professionals. While these are sources we believe to be reliable, we cannot guarantee this report is accurate or complete. This information is not intended to be used as investment or tax advice without consulting a professional about your personal situation. We license these educational reports to share with you and encourage you to sign up for our email newsletter. Images and clips used in this video are royalty-free or licensed allowing modification, sharing and commercial use.